Summary: Hotel & Leisure Advisors, LLC’s (H&LA’s) summer 2009 survey of indoor waterpark resorts in the U.S. and Canada indicates that the number of new indoor waterpark resort projects is expected to decline in 2009 and 2010 after steady growth from 2004 through 2008. However, despite the economic recession in both the United States and Canada, a number of exciting new projects will be opening in 2009 which will create leisure opportunities for family travelers. 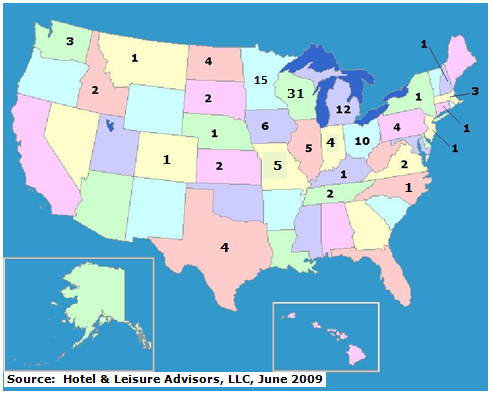 Our research indicates there are 139 open indoor waterpark resort properties in the United States and Canada as of June 2009. Of the total, 48 are considered “indoor waterpark destination resorts” offering more than 30,000 square feet of indoor waterpark space. Additionally, our survey found that in 2009 the growth in indoor waterparks in terms of square footage will be the smallest in over five years. There have been or will be 13 indoor waterpark openings and four expansions of existing indoor waterpark resorts projected for 2009. The 2009 openings include only two indoor waterpark destination resorts. Developers are still showing significant interest in constructing new indoor waterparks but, due to the current challenges of finding financing and investors for these entertainment-related projects, most projects are in a holding pattern. Definition: An indoor waterpark resort is defined by H&LA as a lodging establishment containing an aquatic facility with a minimum of 10,000 square feet of indoor waterpark space and inclusive of amenities such as slides, tubes, and a variety of indoor water play features. Although numerous hotels bill their indoor pools as waterparks, those with less than 10,000 square feet should be categorized as properties with water features rather than as waterparks. H&LA has divided indoor waterpark resorts into two categories: hotel with indoor waterpark and indoor waterpark destination resort. A hotel with indoor waterpark is a hotel with an attached indoor waterpark with 10,000 to 30,000 square feet of indoor waterpark space where the indoor waterpark serves as an amenity of the hotel versus a true destination. 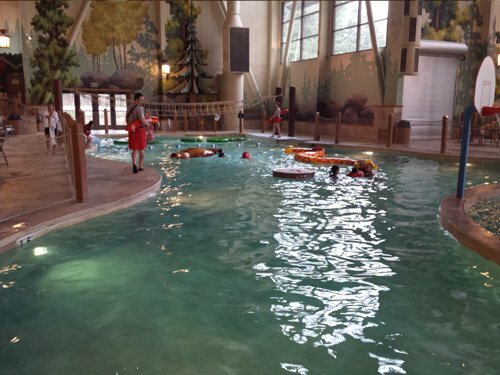 An indoor waterpark destination resort is a resort with more than 30,000 square feet of indoor waterpark space and is considered a true destination resort, which families visit on a year round basis primarily to visit the waterpark and secondarily to visit other attractions or events in the area. An indoor waterpark destination resort will typically have a number of slides and pools and high quality theming. A hotel with a smaller indoor waterpark may offer only a few slides and pools and little or no theming. Existing Supply: We have conducted a survey to determine the number of indoor waterpark resorts which were open as of mid-year 2009 and those which are projected to open by year-end 2009. 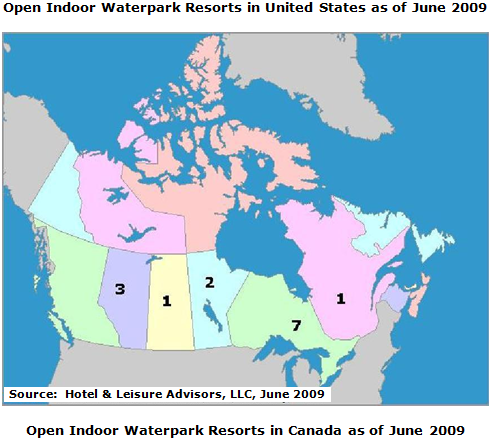 The following maps indicate the number of open indoor waterpark resorts in the United States and Canada by state/province. We have been tracking the supply and demand of indoor waterparks since 1998. 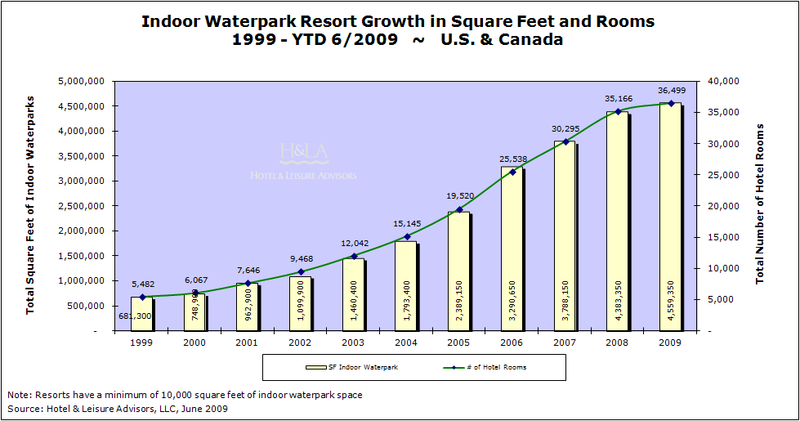 The following table indicates the growth in supply of indoor waterpark resorts between 1999 and 2009. It should be noted that the figures used for the waterpark square footage indicate the net indoor waterpark area which excludes areas such as the arcade, gift shop, mechanical rooms, etc. For advertising purposes, some resorts indicate higher figures by including these additional spaces. The table indicates the supply of indoor waterpark resorts as of June 2009. Of the 139 existing properties in the United States and Canada, 48 of the properties are considered indoor waterpark destination resorts, offering more than 30,000 square feet of indoor waterpark space. Of these 48 destination resorts, 11 are Great Wolf Resorts – the largest chain of indoor waterpark destination resorts in North America. The second largest chain of indoor waterpark resorts are the CoCo Key Resorts which account for 10 properties that are connected to a variety of hotel franchise properties. The remaining destination resorts are independently owned. Between 2006 and June 2009, 39 additional indoor waterpark resort properties have opened in the United States and Canada. Sixteen of the 39 are considered indoor waterpark destination resorts. The vast majority of indoor waterpark resorts are independent properties not affiliated with a national hotel franchise. 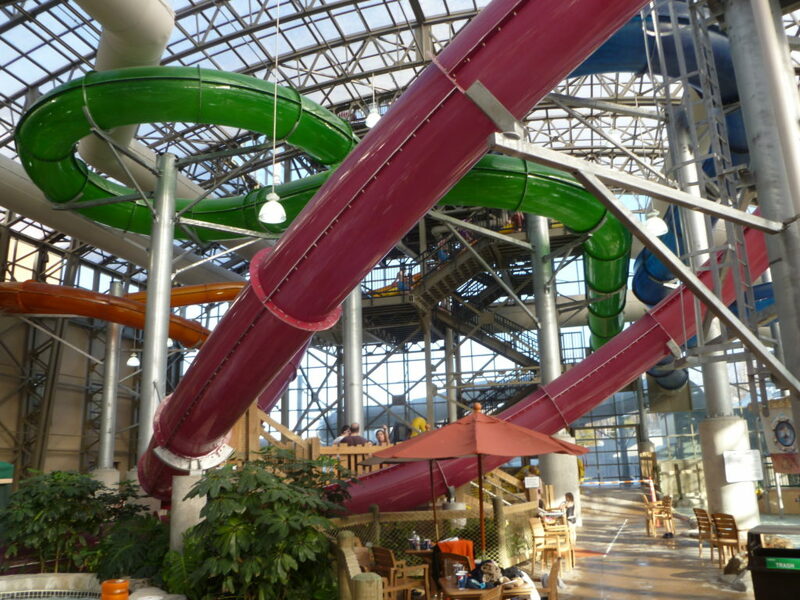 Indoor waterparks connected to franchise hotels represent approximately 35% of the room supply. The following table indicates the chains which offer the most properties connected to indoor waterparks. The following table indicates growth of indoor waterparks between 1999 and YTD 2009 in terms of waterpark square footage, number of guest rooms, and the number of properties. The table indicates that through June 2009 the growth in indoor waterparks in terms of square footage has dropped off considerably since 2008. Based upon the remaining openings projected for 2009, the new supply of rooms and waterpark square footage for the year will be the smallest in over five years. The decline in new development has occurred in conjunction with the national slowdown in the hospitality industry and the U.S. economy indicating that the decline in growth is most likely due to the current economic recession and the resulting challenges of finding financing. In spite of the economic slowdown, the performance of many indoor waterparks continues to be positive. For example, the Great Wolf Lodge chain reported relatively strong occupancy and average daily rate for year-end 2008 as compared to 2007. For 2008, the chain reported an overall occupancy percentage of 63.6% with an average daily rate of $253.85. Other properties we reviewed in 2008 exhibited similar higher levels of performance indicating a trend by travelers to take shorter vacations and stay closer to home. Although performance of many indoor waterpark resorts continues to be positive, other properties have not faired as well. Several properties have struggled or gone bankrupt in 2008 and 2009. These properties include the Maui Sands Resort in Sandusky, Ohio; Double JJ Resort in Rothbury, Michigan; Three Bears Lodge in Warrens, Wisconsin and Lodge at Cedar Creek in Rothschild, Wisconsin. All four properties are currently working through bankruptcy or foreclosure proceedings and hope to be sold or reopen in 2009/10. The challenges faced by these properties and others indicate the need for strong management and marketing for an indoor waterpark resort. Properties need to plan well for financing and other financial issues. Those properties suffering financially were unable to achieve a strong enough level of performance to pay outstanding balances on loans and other expenses. 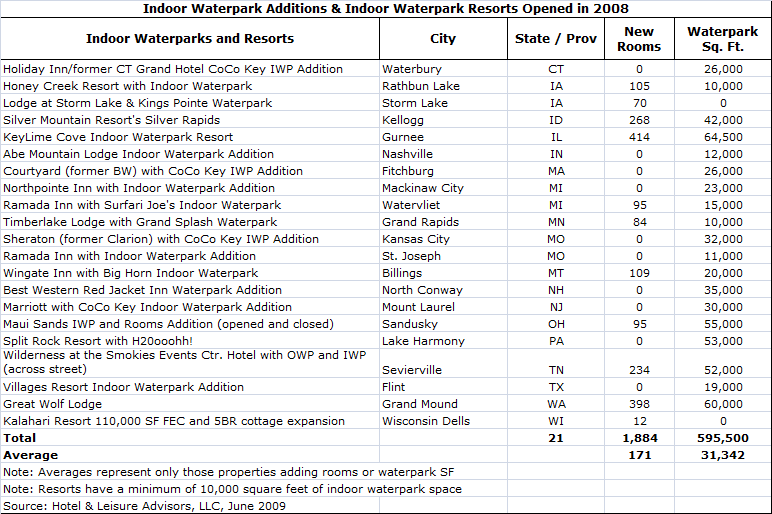 2008 Openings: We have tracked the openings of indoor waterpark resorts in 2008. The table indicates that 21 hotel properties with indoor waterparks opened or expanded in 2008. Of the properties that opened in 2008, eight were newly constructed facilities while the remaining 13 were additions to existing hotels or additions to existing indoor waterpark resorts. Of the 21 properties opened or expanded in 2008, eight are considered destination resorts (over 30,000 square feet). The largest destination resorts to open were The Great Wolf Lodge in Grand Mound, Washington, and the Key Lime Cove Resort in Gurnee, Illinois. Both properties feature multiple restaurants, gift shops, spas, larger indoor waterpark areas, and themed guest rooms. 2009 Projected Openings: We analyzed the openings or expansions of indoor waterpark resorts occurring or scheduled for 2009. 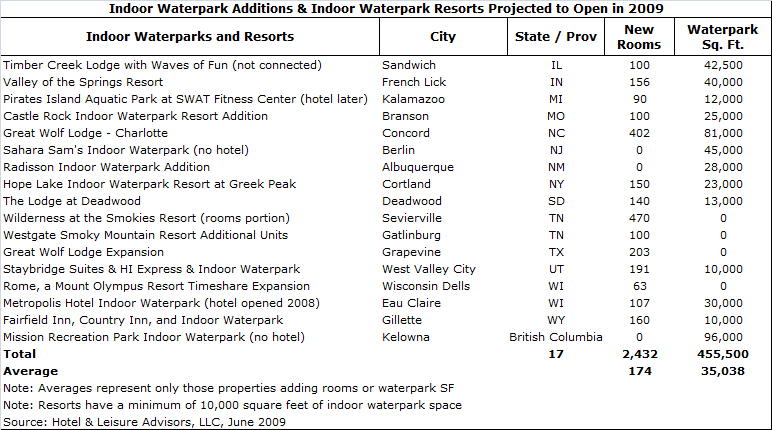 Based upon our research, we project 17 indoor waterpark projects will open or expand in the United States and Canada as shown in the following table. In our projections we include three stand-alone destination indoor waterpark properties without attached hotels. These three properties are located in British Columbia, Illinois, and New Jersey. We have included these properties as they are large and they offer a wide range of indoor waterpark amenities including Flowriders and various other slides and attractions. Of the remaining 14 hotel projects, only two represent new construction indoor waterpark destination resorts. The new constructions are the Valley of the Springs Resort in French Lick, Indiana, and the Great Wolf Lodge in Concord, North Carolina. In addition to the 17 resorts listed above, we are also tracking 321 proposals for new indoor waterpark resorts or indoor waterpark additions to existing properties. Developers have a high level of interest in constructing these entertainment related projects but due to the current challenges of finding financing and investors, most projects are currently on hold. The financing challenges of the overall United States economy have had a major limiting impact on the new development of hotels in general and indoor waterpark resorts specifically. We have highlighted recent openings of and changes to waterpark resorts in the bullet points below. The Wilderness at the Smokies Resort is an extensive development in Sevierville, Tennessee. The first phase involved the development of the 264-room Stone Hill Lodge attached to the Sevierville Event Center which included an outdoor waterpark. The Wilderness at the Smokies opened much of the 440-room River Lodge and the adjoining 52,000 square foot indoor waterpark in December 2008. The property opened the remaining guest rooms in January 2009. The resort restricts the usage of the indoor waterpark to the resort guests, the guests of the Wilderness Event Center Hotel located across the street, and the adjoining Wyndham timeshare owners when completed. Great Wolf Lodge opened its newest property in Concord, North Carolina, outside of Charlotte in the spring of 2009. The property offers 402 rooms and an 81,000 square foot indoor waterpark. The indoor waterpark is the largest resort in the Southeastern United States in terms of square footage of indoor waterpark area. This is the 12th property managed by Great Wolf Resorts. The Castle Rock Indoor Waterpark Resort opened in Branson, Missouri, in the spring of 2009. The property offers 200 guest rooms and a 25,000 square foot indoor waterpark. This property began as the exterior corridor Atrium Inn and added an entirely new interior corridor hotel with the indoor waterpark adjacent to the existing property. The Valley of the Springs Resort opened in French Lick, Indiana, in the spring of 2009. The property is located close to the French Lick Casino and Resort. The property offers 154 guest rooms and a 40,000 square foot Big Splash Adventure indoor waterpark. The waterpark includes a retractable roof. The property also includes 1,100 acres of land where it promotes horseback riding and other ranch activities. Hotels in warm weather climates are beginning to include outdoor waterparks as part of their resort developments. For example, the Hyatt Regency Huntington Beach Resort and Spa in California added the $4,000,000 Slyders Water Playground outdoor waterpark area inclusive of three waterslides, children’s wading pool, Jacuzzi, and outdoor pool in the spring of 2009. Waterpark resorts continue to emerge as a leisure option for families looking for a convenient weekend getaway or vacation. Historically, the indoor waterpark resorts were located in the Wisconsin Dells region, but growth continues throughout the United States. An important trend is occurring in the indoor waterpark resort development field. Larger resorts such as the new generation Great Wolf Lodge properties are achieving stronger levels of performance than the smaller indoor waterpark additions to existing hotels or new construction properties. Because the larger properties (offering waterparks over 60,000 square feet) offer a greater number of amenities, families return to the resort more often. These properties are able to achieve higher levels of occupancy and average daily rate despite their higher room counts. We project continued interest in the development of indoor waterpark resorts in the northern United States because they offer an attractive year-round leisure opportunity for families and attractive investment returns for developers. We also project growth in outdoor waterparks at hotels in the southern United States as these represent a lower cost of construction and can boost a hotel’s summertime performance. With the current challenges in the financing market, we project the current slowdown in growth to continue into 2010 but project increased growth in 2011 and beyond as lending opportunities increase. The advantage to the current lack of lending is that current owners of indoor waterpark resorts are less likely to face new competition. However, in certain Midwestern states such as Michigan, Minnesota, Ohio, and Wisconsin, the competition for family travelers among the many existing indoor waterpark resorts combined with the economic recession has limited the performance levels of the existing properties. Before a new project is developed, we recommend a thorough feasibility analysis be performed to ensure that the project’s return on investment is adequate for the development. For existing projects, we recommend a creative and experienced management team be hired in order to generate a higher level of demand for the property. This article was originally published by Hotel Online.